Do you remember when you saw your first concert? Were you 10, 12, 15 years of age? Cameron attended his inaugural live production on Saturday- "Elmo Makes Music" at the Van Andel Arena!! Grandma and Coco accompanied Chris, Jane and Cam downtown for the late morning show on Saturday. No one was quite certain how Cam would react...would the atmosphere be too loud? Does a huge live Elmo make sense? All apprehension was put to rest when the family saw Cam's reaction seeing his favorite Sesame Street char acters come to life on stage. As one of Elmo's biggest fans, Cam stayed very e ngaged through the entire show, even though the red furry character with the funny voice wasn't in every scene. The 90 minute show had a 15-minute intermission, during which the marketing folks were busy bringing out ballo ons and treats for sale. Chris captured a big Elmo balloon for Cam, which turned out to be almost as big as the boy himself. After dining downtown for lunch, the family headed home with one extremely happy boy! Sunday was another winner for Cameron. After attending church, his friend and neighbor, Emma came over to play. That evening, Chris, Jane and Cam had dinner with another buddy, Liam, and his parents- Matt and Betsy. 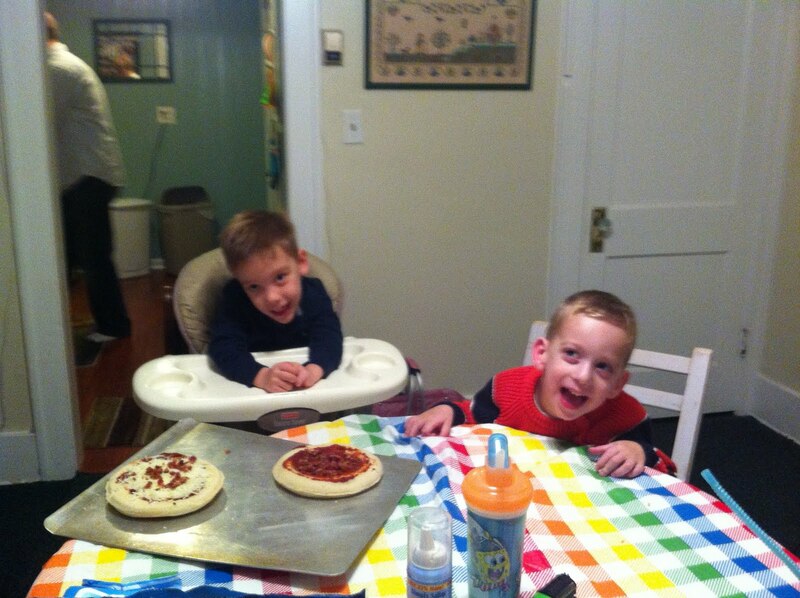 The boys are pictured here showing off their personal pizzas that they helped create for their dinner. The boys had fun playing with Liam's fire truck and play workbench. It was an awesome evening with great friends! We couldn't agree more with the red furry monster ! !